The local bookseller here, Mr. Cotting3, says he ordered 25 copies of "Antonia"4. Only 12 were sent him, and he has sold those. The people who can't get a book will borrow their neighbor's. Will you please ask your shipping department why they did not send his full order? In a previous letter5 I gave you the date of your acknowledgment of his original order, made last spring. Friends6 in Toronto, Canada7, wrote me that they cannot get the book there. Document is one leaf, handwritten on recto only. 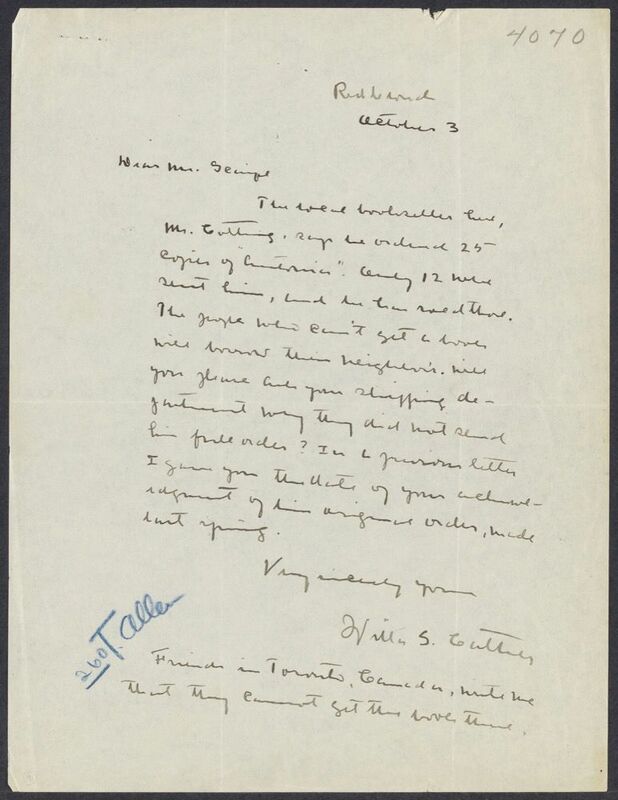 The year of this letter is established by corresponding letters to Cather from Houghton Mifflin staff. Scaife, Roger Livingston (1875-1951). Head of publicity at Houghton Mifflin. An 1897 graduate of Harvard University, Scaife went to work for Houghton Mifflin in 1898 as assistant to Azaria Smith, head of the publicity department. Scaife subsequently assumed Smith’s position and became a shareholder of the corporation and secretary of the board of directors. In 1910, when Ferris Greenslet became editor in chief of the trade department, Scaife divided his shares with him, and the two presented themselves to authors as partners, with Scaife handling book advertising and format and Greenslet negotiating contracts and supervising editing. Scaife anonymously published three satirical novels with Houghton Mifflin, The Confessions of a Debutante (1913), Cape Codities (1920), and The Reflections of a T.B.M. (1920), and two books of children’s verse under his own name. 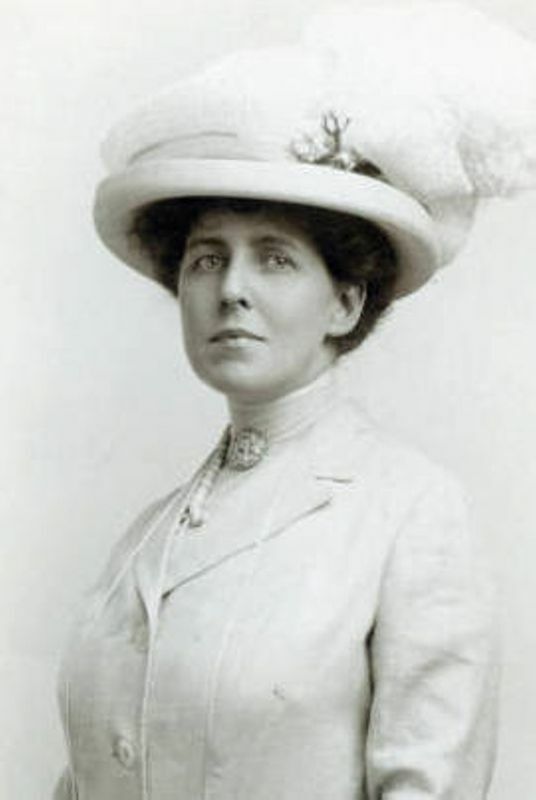 Cather corresponded primarily with Greenslet about her novels, but in his absence she dealt with Scaife during the production of My Ántonia (1918), and her dissatisfaction with decisions made on his authority contributed to her decision to transfer her publishing business to Alfred A. Knopf, Inc. In 1934 Scaife left Houghton Mifflin to become executive vice president of Little, Brown. He later became the fourth director of Harvard University Press. Cotting, Charles L. (1849-1928). Red Cloud drugstore owner. Born in Bristol, Wisconsin, Cotting married Hannah Amelia Upson in 1874; they came from Illinois to Red Cloud, NE, in 1884, where they raised their two surviving daughters, Florence and Jennie. Cotting retired from business in 1924. His drugstore also carried books, including Cather's. She notes in her letters that he had featured The Song of the Lark (1916) in the store window and later couldn’t get enough copies of My Ántonia (1918) from Houghton Mifflin.